Posted May 31, 2018 by Eds. The 71st World Health Assembly (WHA), held in Geneva from 21-26 May, had a discussion on the Director General’s report on health conditions in the occupied Palestinian territory and the occupied Syrian Golan, and a draft decision brought forward by 28 countries, asking the World Health Organization’s (WHO) Secretariat to continue with health-related technical support in Palestine. The report is the result of field observation and cooperation between WHO and Palestinian health authorities, aimed at strengthening the health system in Palestine. 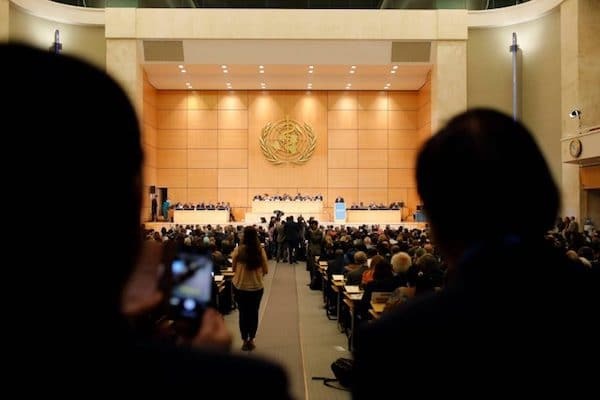 The question of the Israeli occupation of Palestine is a recurring topic on the agenda of the WHA, where a number of countries take initiatives to actively condemn the consequences of Israeli action in the Gaza Strip and other occupied territories. On this occasion, the report was welcomed by a number of countries, who expressed their deep concern for the health consequences of the occupation of Palestine. Bolivia, Cuba, Iran, South Africa, and others, underlined that the presence of military forces and violent interventions by Israeli forces not only put the Palestinian health system under heavy pressure, but they also have extreme consequences on the population’s mental health. In addition to that, they condemned the recent events where over 60 unarmed civilians were killed in violent action by Israeli forces, as previously described in PHM’s statement. Country delegates said that instances of violence are also visible in the imprisonment of large numbers of minors and women. The Palestinian delegate brought up the example of a 3-year old who was recently detained by the military, presumably leaving long-term consequences on his mental health. This example is correlated by data in the report showing that over 300,000 children in the Gaza Strip are in need of psychosocial support. Additional concerns were raised when the topic of mobility and safety of patients and health workers arose. As noted by delegates, checkpoints and physical barriers hinder patients’ possibility to access health care facilities, as they are usually forced to travel long routes and face document inspection. Patients residing in the Gaza Strip must have security permits to access healthcare in Israel, 12% of which were denied in 2017. During the same year, says the report, “WHO received records of 54 patients who died while awaiting security approval by Israeli authorities for referral out of the Gaza Strip. Three deaths were in children under the age of 18 years.” Such limitations to access to necessary care, warned supporting countries, are a direct infringement of human rights and should be stopped immediately. The support by delegates for the Palestinian cause was unanimous until USA took the floor and accused any attempt to politicise the work by WHO, seeing the discussion on health in Palestine as such an attempt. The USA intervention was along the lines of an earlier address by the Israeli delegate, who framed the situation in Gaza as a health emergency, saying the DG’s report is biased. USA accused country representatives of hypocrisy for overlooking Syria’s attack on its own citizens. USA covertly reminded the WHA that it is the biggest funder of Palestine, nudging country representatives to vote against the resolution. Interestingly enough, apart from USA, there were no interventions from speakers from the European or North American region, who are usually quite active on the floor. USA called for a public vote on the draft decision. This led to a shift of direction, as most countries abstained from voting or left the room. Regardless of this, the draft was adopted by 90 votes in favour and 6 against, namely Australia, Canada, Guatemala, Israel, UK and USA. Among the 68 countries who abstained during the vote, it is interesting to note the case of India. India used to be a key supporter of the Palestinian cause in all UN meetings, including in the WHO. Traditionally, India would vote in favour of resolutions on Palestine till 2016. 2017 was the first occasion when India abstained during voting on a resolution on Palestine, clearly because of orders received from New Delhi, given the current Government’s growing economic and strategic relations with Israel. The outcome of the discussion means that WHO will continue to provide technical support to strengthen the health system in occupied Palestinian territories, but the general outcome of the vote shows that a significant number of countries are still not willing to confront the situation in Palestine.